Media or Filters (Pre-Filter, Carbon and HEPA) Electronic Collection Cells, sometimes carbon, sometimes pre-filters, sometimes vaporizing sprays. 625 CFM to 1500 CFM actual throughput. 800 to 2000 CFM raw fan speeds. We report BOTH so we can calculate airflow based on true airflow through the machine with filters installed, not the free flow fan speed. Unsure if this is fan speed or actual throughput. Specs don't indicate. Be sure to ask the real throughput number as configured with pre-filter, electronic cells and carbon if applicable. Ranging from $1,495 to $2,095 per machine including a year's worth of filters and FREE Shipping. Ranging from $1,000 to $3,200 per machine plus the extra chemicals and tools for maintenance, optional carbon filters and optional pre-filters. Messy, time consuming cleaning jobs. They say every 1-2 months, but in reality - if you want the best performance, expect to clean your electronic machines every 2-3 weeks. How long before you need to buy maintenance items? You get a full year's filters included with each machine. Nothing to buy for a year. You will likely need to buy the cleaning kits which include tubs, sprays and cleansers. Extra pre-filters and carbon filters may need to be purchased as well. In some cases these are optional and need to be bought up front. Approximately 5-10 minutes per machine per month to swap the filters. Realistically at the end of each year, it may take you 15-20 minutes per machine because you will need to change out the HEPA. Estimates range from 3-12 hours per machine including drying time. Open louver, dismantle, pull cells out, try not to get the nasty smoke all over you, spray the cells with cleanser, let it soak, or put into a huge wash basin or commercial dishwasher. Let it dry overnight, spray on coating chemicals to lengthen the life of the cell, reassemble the smoke eater. Yes - with the included carbon filters. Only if the machine has carbon or vaporizing technology. These odor fighting components are often optional in many electronic smoke eaters. Our HEPA performs at 95% at .3 microns. Medical Grade HEPA's are available with 99.97% efficiency, but often the trade-off of reduced airflow doesn't make sense for a busy bar. 99.8% efficiency when fresh, new and clean. Performance drops off considerably as the collection cells get covered with a layer of smoke. The more smoke on the cells, the less efficient. Pre-filters are optional and often washable. Yes - efficiency improves as the filters load. Airflow is reduced slightly as well. However, changing the filters on schedule ensures new filters on a regular basis which will minimize this effect. NO - efficiency drops when the collection cells get dirty. If you aren't meticulous with cleaning, the collection cells get covered with a layer of tar and nicotine further degrading the performance. None Yes - this is normal according to the manufacturers. The frequency gets worse as the smoke eaters get dirty. 60 - 70 db depending on model 60 - 68 db. Slightly quieter fan noise but don't forget the zapping and popping. Ten Years - as long as you change the filters, our machines are covered by a 10 year parts warranty. 3 years manufacturer's warranty. Electronic have so many electronics to break they can't afford to offer a longer warranty. 90-day, unconditional, 100% back guarantee with no restocking fees or charge for dirty filters. 60-90 days but read the fine print. Most have 15% restocking and "applicable" shipping charges. $330 per year per machine. Breaks down to $27.50 bucks a month or just $0.90 cents a day. No, unless you want to control the odors. The electronic company's sales message is, no filters to buy. Yet..
Chemical cleansers are $180 a bottle. No - Changing filters is simple. Many owners subcontract this out because the process is just too messy and time consuming. So, instead of buying a set of filters once a year, you end up spending $100 - $200 a month on a maintenance contract. As you look at this comparison chart, it should be obvious which machine I recommend. 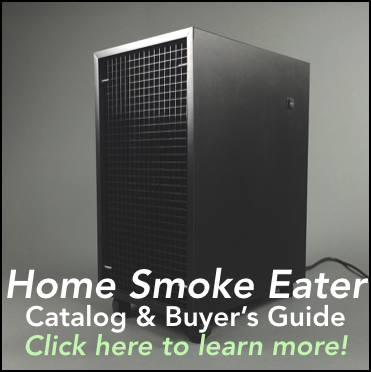 When you factor in the hidden costs of owning an electronic smoke eater, the time consuming and messy cleanup jobs - our SRS Series Filter Based Smoke Eaters are the obvious winner. Check out our Smoke Eaters. 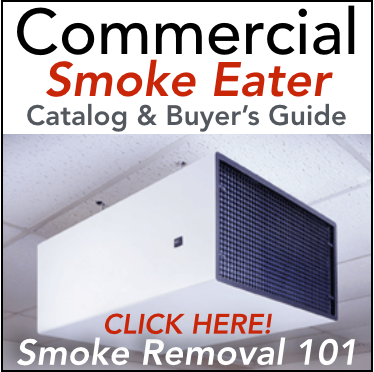 Request a Smoke Eater Quote. I am so happy with the air purifiers and the ultra violet light I installed last year in my bar. The difference is so great. My employees thank me profusely and more than a few regular customers have noticed. I am more than pleased. What a relief to be free of the old electrostatic cells that cost too much and are very expensive and time consuming to clean. The bottom line with my old system is this: even with all the effort, all the time and money I spent trying to keep the units clean, they still SIMPLY DID NOT WORK!! Your products are literally paying for themselves in time, money and satisfaction. I can't believe I went through 16 plus years without a real workable solution. I will need to order more filters, soon. So you will be hearing from me. Feel free to include me in your list of businesses to contact re: results. Disclaimer: Cost figures are estimates after reviewing dozens of competing electronic smoke eaters. Do your own homework on specific models you are considering.